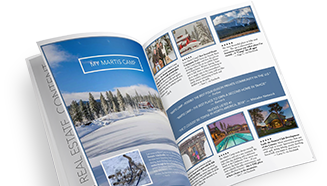 Martis Camp Architecture Review embraces creativity and diversity in home design, while working with owners, architects and builders to ensure that each proposed home is appropriate for its site and compatible with its surroundings. This partnership shares a common goal: the realization of a unique, well-crafted design solution for each property, without overstepping the reasonable limits afforded by this expanded opportunity for design expression. The result of this vision is a growing community with architectural expression unlike any other. From a contemporary home with copper barrel roofs to a rustic cabin of reclaimed trestle-wood to an eco-friendly family lodge with a photovoltaic system, Martis Camp is a growing gallery of inspired mountain architecture. We invite you to stop by our architecture studio to take a look at the evolving display of plans, photographs and models. For more information about Architecture Review, please contact Architecture Review Director Kelly Turner at (530) 550-2990.